EPW027646 ENGLAND (1929). 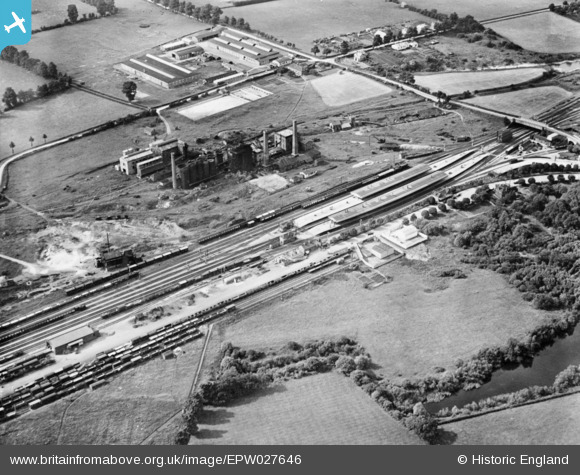 Westbury Railway Station and the New Westbury Iron Works, Westbury, 1929. This image has been produced from a copy-negative. Pennawd [EPW027646] Westbury Railway Station and the New Westbury Iron Works, Westbury, 1929. This image has been produced from a copy-negative. Open air range of steam boilers for the iron works. Narrow gauge track in tunnel under road. Track leads to ironstone quarries. I think that this is my favourite photograph in the collection so far. I was based at Westbury Railway Station for the last 13 years of my working life and I have lots of happy memories.